I decided yesterday that I had my temporary fill of summer recipes like pasta salads and fruit salads so I decided to cook a nonseasonal recipe. You remember those don’t you? The ones that can be cooked and loved anytime of the year! 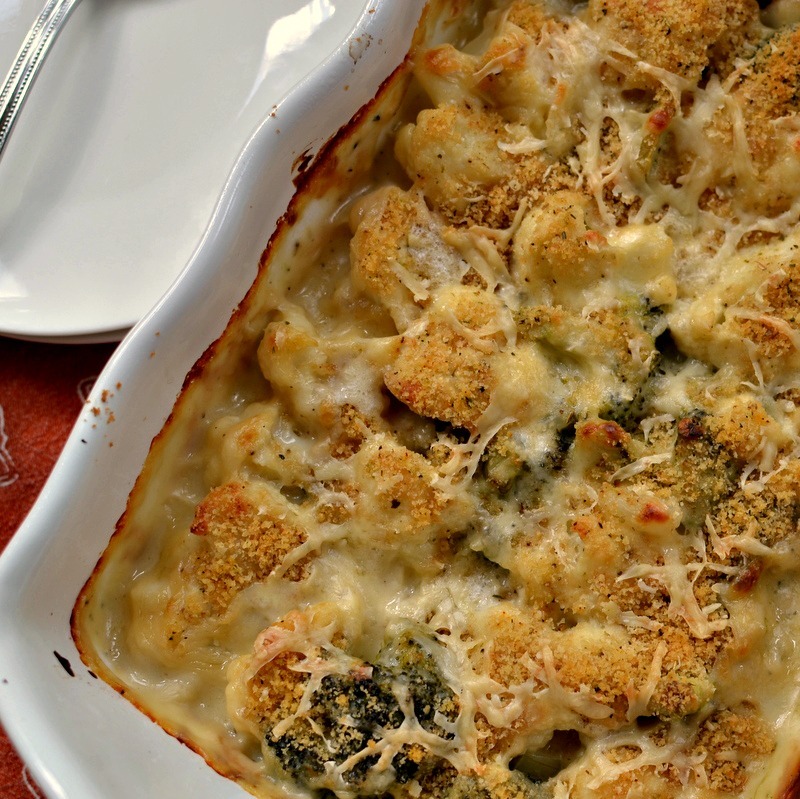 This Broccoli and Cauliflower Bake is as fabulous whether it is hot steamy and sticky outside or whether there are twelve inches of snow on the ground. 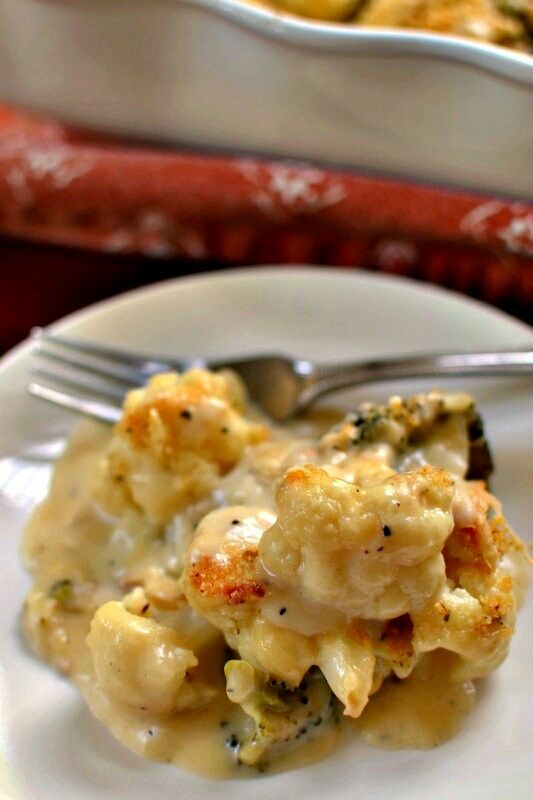 Broccoli and Cauliflower Bake combines roasted broccoli and cauliflower in a heavenly creamy cheddar cheese sauce. It is lightly sprinkled with a super easy crumb topping and baked to golden perfection. How to make Broccoli and Cauliflower Bake. First and foremost you are going to roast your broccoli and cauliflower in the oven until it is very lightly browned. 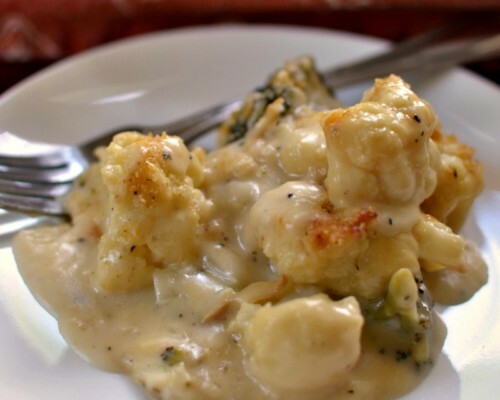 Place the broccoli and cauliflower in a casserole dish sprayed with nonstick spray for easier cleanup. Meanwhile cook the onion and garlic in a little butter. Whisk in the flour and cook for a couple of minutes whisking constantly. Slowly add the milk and chicken broth alternating between the two and whisking constantly. Reduce the heat and whisk in cheddar cheese until smooth and creamy. Add nutmeg and season with salt and pepper to taste. 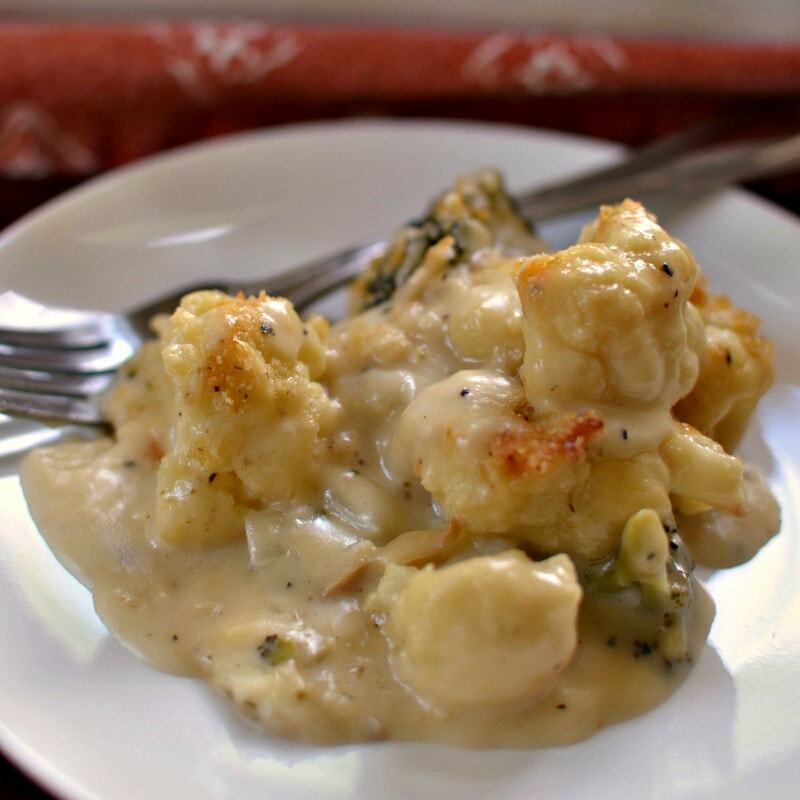 Pour the cheese mixture over the roasted broccoli and cauliflower. Using a food processor or a sealed bag crush the ritz crackers with the oregano and onion powder. Then drizzle in the butter and shake to coat. Finally sprinkle the mixture over the broccoli and cauliflower and bake. How to easily cut broccoli and cauliflower into florets. Wash them both as a full head under cool running water. This allows you to grab a hold of the large stem end and shake almost all of the water out. Then using a cutting board simply take a sharp knife and cut the florets off the main stem. They cut very easily and sometimes even seem to fall off so much pressure on the knife is not needed. Cut the larger florets into halves or quarters to make them bite size. Helpful hints on making Broccoli and Cauliflower Bake. After washing and cutting your broccoli and cauliflower florets dry them well because you want them to roast not steam. Preheat the oven and if at all possible load the casserole onto the middle rack of the oven. Use good quality cheddar cheese. It really does make a difference. If Ritz crackers are not your thing substitute fresh ground croutons or bread crumbs. For added flavor reserve a little bit of cheddar and sprinkle it on top of the crushed crackers. Other great cheeses for this dish are Gouda, Gruyere and Monterey Jack. Feel free to mix them up and have fun. Health benefits to broccoli and cauliflower. Broccoli and cauliflower are both low in calories and high in fiber and protein, helping you feel satisfied after eating them. Both contain beneficial folate, that helps your body form red blood cells and manganese, that helps support strong bones. They both contain glycosinolates, a combination of nutrients that has shown to reduce cancer risk. Both contain a healthy amount of vitamin C which helps convert fat into fuel. Broccoli and Cauliflower Bake is so amazing, easy to prepare, dependable and loved by multiple generations. Put this great recipe on this weeks list to try. You will be so pleased and happy that you did. Every delicious bite is a sweet creamy taste experience. I made this dish many times and it goes like hot cakes. Speaking of hot cakes have you tried my Buttermilk Bacon Pancakes? Oh my goodness! Sorry got a little side tracked there. Food runs through my mind constantly!! Other vegetable recipes you will love! This post was originally publish June 20, 2017 and was republished November 8, 2018 with new content. 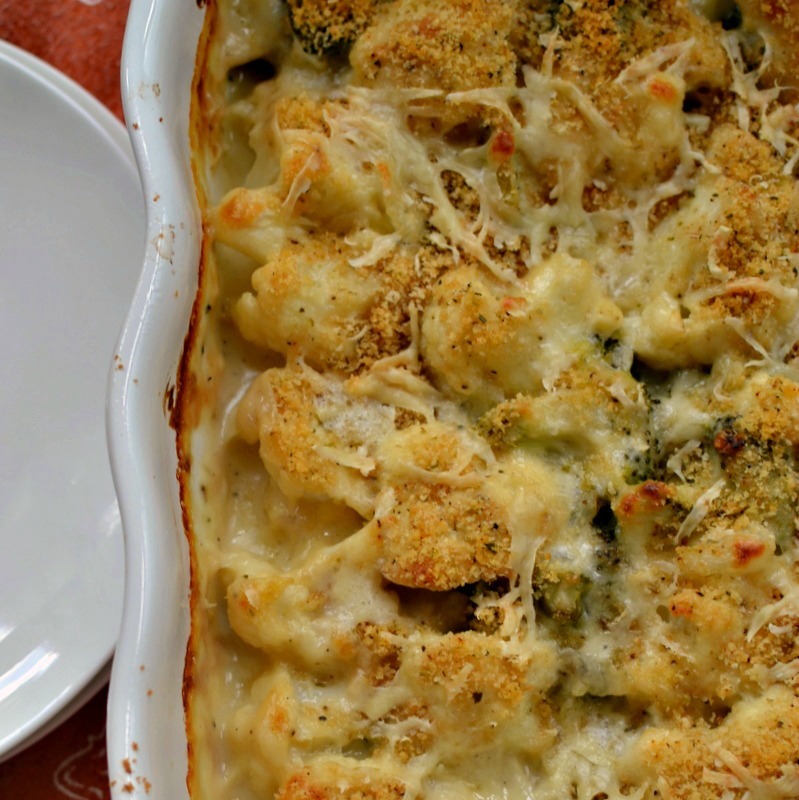 Broccoli and Cauliflower Bake combines roasted broccoli and cauliflower in a creamy cheddar cheese sauce sprinkled with a super easy crumb topping. If the ads didn’t pop up between the list of ingredients and the instructions, I could get a screen shot of all of it. You can’t get rid of them. So frustrating!!! Sorry it is how I pay for hosting fees, food and some of the cost of running this household. There are tons of other expenses that I have not even gone in to like increased taxes since I am self employed, software fees etc. Good morning Kay! Yes you can. Happy cooking! Hi… so what is your thought on doing this for Thanksgiving? Too rich? My husband doesn’t like green beans, thus no green bean casserole! !… I have tried substituting broccoli. Just think this might be a good substitute!! (he loves ritz crackers!!) Is the roasting necessary? I think this would be great for Thanksgiving. Yes I think the roasting part is necessary for the whole dish to come together. Can this casserole be made ahead of time and baked the following day? Looks wonderful!! Thank you! Yes you can. It would be better if you could mix and add the crumb topping shortly before putting in the oven. In addition to that I would pull the casserole from the fridge about 30-40 minutes prior to popping in the oven to get the chill off. Used Ritz Vegetable flavor, so good!! Yummy! So glad that you liked it! Honestly can’t figure out the 48 gems of carbs?? Crackers? I would be interested in the fiber content as well. ThNks for the idea. The program that I use does not provide fiber. Sorry! The programs that are available are only so accurate. I use one of the best ones on the market however it is not perfect. I am sure the carbs are coming from the crackers.